Welcome to the Elkhorn Farm & Forge, where we raise pigs the old fashioned way: outdoors, where the pigs roam freely on pasture and in the forest. 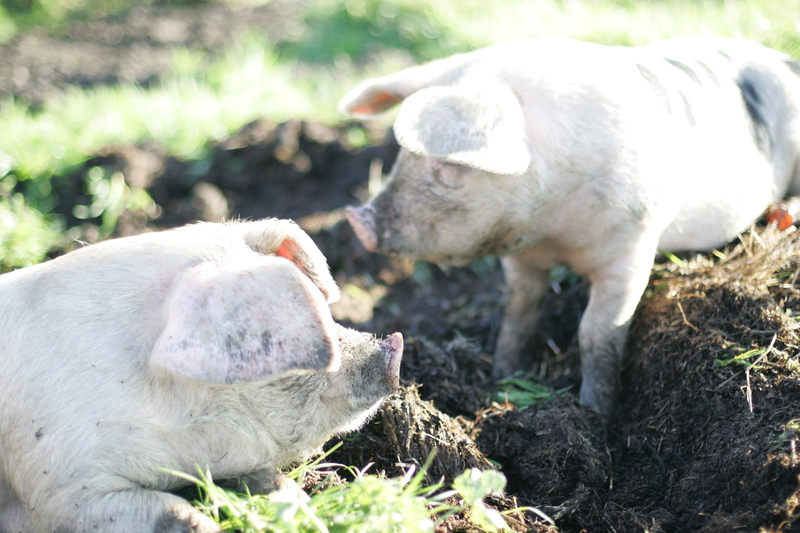 They spend their days rooting, running (they actually run a lot), and resting in contented happiness. Our “old timey” practices are great for the pigs and great for the table. We specialize in the heritage Gloucestershire Old Spot (GOS) breed, known for having a pleasant disposition and extra tasty eating. We also raise the heritage Large Black breed as well as crosses between the two. Our pigs live the good life here at Elkhorn and we enjoy having them here. Our philosophy is, everything we do here is great for the pigs or we don’t do it at all. When you buy pork from Elkhorn, you are supporting happy hogs, raised locally in their natural environment without added hormones or sub-therapeutic antibiotics. All this extra attention pays off at the dinner table. This pork is extra tasty! Our customers have commented that the taste is “gourmet restaurant quality”. We agree and we’re committed to providing you with a fantastic eating experience. We sell pork farm-direct to local eaters in whole and half shares as well as boxes of mixed cuts if you don’t have much freezer space. To purchase pork, please visit our Online Store. Not sure what’s involved in buying a whole or half-share of pork? No problem, we help first time buyers navigate the process and make it easy. Please see our Q&A page for more information. We are your local source in the Portland metro area for humanely-raised gourmet pork and we look forward to sharing it with you and your family.